Dive into sweet, salty, and savory flavours of the Brazilian kitchen with Summer Marsh. Share the post "A student’s guide to Brazilian cooking"
With the rise of immigration, there is a change in Dublin’s ecosystem, with an exciting plethora of new cultures, attitudes, and foods. Here are some ways to expand your palate while keeping under budget. While Brazil itself is the fifth largest country in the world, throughout the country you can find the continuity of a simple yet delicious dish: rice and black beans. Often turned into feijoada with the addition of pork, this classic meal can be found almost everywhere. This dish, while appearing plain to the untrained eye, is packed with high protein and healthy carbohydrates to keep you full the entire day. Yet another even more versatile kitchen staple to have is tapioca. Made from cassava, tapioca comes as a white powder with a neutral flavour and low in calories. One way to prepare it is by pouring thin crepe-like amounts into a pan on high heat and cooking it like a pancake. Fill it with cheese and ham to have a savory treat, or to satisfy a sweet tooth, add strawberries and cream. Apreciar! What’s better than cheese and bread? 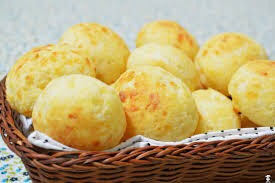 Brazilian pão de queijo, which literally translates to cheese bread! While Brazil shares Ireland’s affinity for dairy, they have gone a step further and created this masterpiece of a dish. You can try this treat on your own by stopping by a Brazilian market such as O Brasileiro Shop on Capel Street and Brazuca’s on Parnell Street, and snagging a bag of the pre-made flour. Add two eggs and some cheddar, roll into balls, and bake until it’s a soft gold for perfection. Recreating these exotic dishes at home may seem intimidating but Irish and Brazilian kitchens can overlap in more ways than one. Tea is loved internationally, and if you’re courageous enough to stray away from your Barry’s and Lyon’s, try Matte Leão and gain bragging rights about how cultured you are. If coffee is more your style, pick up a package of Pilão and never sleep again. An article about Brazilian gastronomy cannot be complete without mentioning the king of all soda drinks: Guaraná. A can of this can double as an energy boost (and rumors say aphrodisiac). Sugary sweet, it epitomizes the alluring appeal of exotic treats. While Brazil is an ocean away, you can explore its food culture through your kitchen. Sweet, salty, or savory, you can find something to fall in love with in Brazilian gastronomy.